The No.35 Squadron ( Rapiers) of the Indian Air Force operates as a EW and Air superiority unit. Based at Bakshi Ka Talab AFS, No. 35 Sqn falls under the Central Air Command, and along with No.108 Sqn ( Hawkeyes), forms an operational wing of the IAF. No. 35 Squadron has as it's emblem an erect Rapier. Below this crest, on a scroll is inscribed Drutpraharnayudha. No 35 squadron was raised in Pune on 10 August 1958 equipped with Canberra B(I) 58 under the command of Wg Cdr NB Naik . 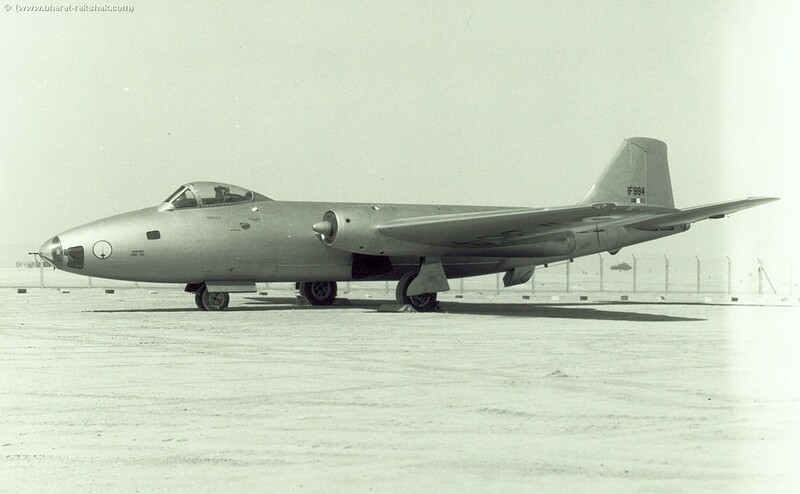 It became the fourth unit to operate the Canberra bomber in the Indian Air Force and was initially tasked with high altitude bombing and interdiction as well as reconnaissance roles. The unit also appears to have had a secondary responsibility of high altitude weather research.. No. 35 Sqn has been involved in all of India's major military operations, from the liberation of Goa to Operation Safed Sagar during the Kargil War, when it was deployed Kashmir Valley and the Rann of Kutch . It was re-equipped with modified Canberra B(I) 58 and Mig 21Ms for dedicated EW role. In 1978, the unit was moved to AFS Bareilly. Since the 1980s, No.35 Squadron has played an important role in collaborating with DRDO in the evaluation of EW systems and armaments. The unit's Canberra flight was withdrawn in 1997 and re-equipped with EW-equipped MiG-21Ms. The unit also fills and important training role. In 2001 the Squdron phased out it Canberra B(I) 58. The squadron is currently in the process of upgrading its equipment from the MIG21 BIS aircraft. In addition to providing support to offensive air operations, he Rapiers play a crucial role in providing flying effort towards EW related training for the IAF's own air defense units and currently operates from Bakshi-Ka-Talab. No.35 Sqn's Canberras were first moved north during the confrontation with China. In the event that no air action was authorized during the conflict in November 1962, no combat sorties were flown by any Canberra units. The squadron's first sustained combat operations occurred during the Indo-Pakistani War of 1965. The squadron, then based at Halwara under Wg Cdr Bakshish Singh, went on alert in late August 1965. Over a ten day period, beginning 1 September 1965. The squadron flew 69 operational sorties. The most intense missions against Kasur and Sargodha being flown between 7 and 10 September. Although the Squadron flew with distinction (Sqn Ldr JP Gupta earning a Mention-in-Despatches for bombing Kasur), a spate of accidents caused the unit to be withdrawn from action after 10 September 1965. The war in 1971 provided this young squadron an opportunity to perform to its full potential. During the war, No.35 Sqn's Canberras flew day and night missions on both fronts. A total of 92 operational sorties amounting to 900 hours were undertaken by the squadron during the conflict. The highlight of war was its bombing of the oil refinery at Karachi - resulting in, according to a recce pilot, "the biggest blaze ever seen over South Asia." While the squadron lost an aircraft and two pilots (Flt Lt SC Sandal and Flt Lt KS Nanda) over Karachi, the raid earned Wg Cdr KK Badhwar a Vir Chakra. Over the course of the conflict the squadron earned one Ati Vishisht Seva Medal, five Vir Chakras, six Vishisht Seva Medals, one Vayu Sena Medal and three Mention-in-Despatches. 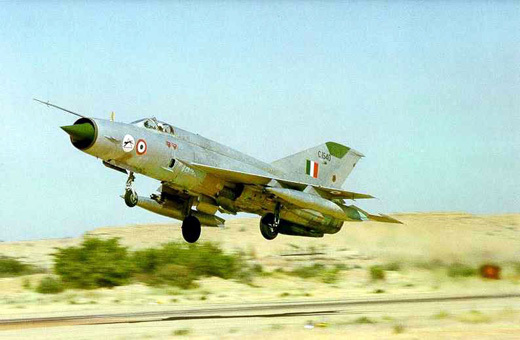 A Mig21M under IAF operation. This aircraft belongs to the No.37 Panthers Squadron, as shown by the emblem on the nose. The Squadron went on alert during Operation Safedsagar in the summer of 1999. The squadron deployed a flight each to support offensive and defensive operations by Western and South Western Air Command (SWAC). No.35 Sqn's aircraft deployed to bases in Kashmir as well as to the Rann of Kutch. No 35 Sqn was last in news as the unit, which took over the Mig-25 Fleet when No.102 Squadron (Trisonics) was disbanded. The Canberra Flight of 35 Sqn has been dissolved and the Mig21-bis will also be retired over a period of time. No 35 Sqn has been reduced to paper status and the unit will acquire new aircraft and a new role in the near future.